St. Paul stadium: What might have been? With all the gushing and attention surrounding the opening of Target Field in Minneapolis, is St. Paul having any regrets? In the 15+ years of debate about the stadium, only St. Paul residents got the opportunity to vote on it, when they rejected the idea in 1999. The Twins never really embraced the city — the owner seemed to view St. Paul as a second-banana city — but it was the only “deal” the team could find. There were five possible stadium sites. Only one still may end up with a stadium — Lowertown near the former Gillette plant — if public funds are used to build a new facility for the Saint Paul Saints. What’s happened to the other four sites in the following 11 years? Not much. Have a look. Most of the area between Wabasha and Robert Street has still not been developed. But the spot where the stadium was to go has been. US Bank built a large office complex there in 2003. Although the site afforded a beautiful view of the downtown skyline, it would have been a nightmare for access. There is no way to get to any major highway without driving through a neighborhood on one of the two streets. Could it have been a great venue? A circus there last summer proved it could be. The stadium would’ve allowed a view of the city — the large post office building evokes memories of the old Yankee Stadium’s centerfield view — and the Mississippi River. But it would’ve involved buying rights from the railroad. Traffic would’ve been difficult. The city encouraged the post office to leave town and it has since decided to do so. But the building is still for sale and there’s little chance it will be the site of significant development anytime soon. This is the site that probably made the most sense, which carried the biggest political problem. It’s across the street from the Xcel Energy Center. It also would’ve required demolition of a homeless shelter (shown), which provided stadium opponents with the perfect metaphor for stadium economics. 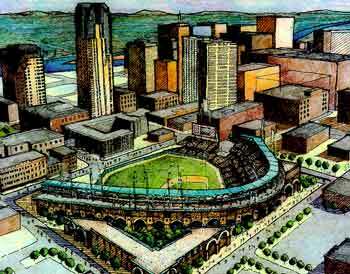 A stadium there also could’ve destroyed the downtown view of the city’s iconic Cathedral of St. Paul. No matter. 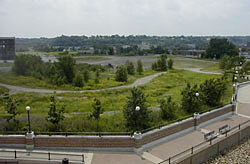 A transit center has been built on much of the property, which also damaged the view of the Cathedral from downtown. But wait, there’s more! Had St. Paul voters approved the stadium, Twins owner Carl Pohlad would have sold the team to Timberwolves owner Glen Taylor and Robert Naegele. Naegele has since dumped the Wolves Wild. Taylor has presided over the destruction of the Timberwolves as a serious sports franchise. FIX: “Naegele has since dumped the Wolves. ” He dumped the Wild. Plus, Glen Taylor, not Glenn Taylor. Yes, I am a pedant, why do you ask? St. Paul has a baseball stadium, and at $5 a ticket, it’s my venue of choice.